Norton Paperback. 1996, first published in Great Britain, 1993. 349 pgs with Scots dialect glossary. Guardian 1,000 Novels: State of the Nation Titles. I’ve promised myself that the next three books (at least) are all going to be Guardian novels so I can have some hope of “moving forward” as we like to say, towards my almost ridiculous goal of reading the 1,000 best! Welsh explained that he wrote this way because he wanted to speak out in the characters’ own voices; in contrast to writing with a “waspish” narrative voice that demeans and talks down to the characters. It would be a joke for me to try to “review” this book — I have no understanding of the world these characters inhabit. As a reader, I shifted from being repulsed, frightened, amused, grieved, angry, and once and a while, touched, by these fragments of stories. There is no real organization to the novel. You are simply dropped in and out of these peoples’ lives — some characters are constants, such as the antihero, Mark Renton — and some play mere cameo roles such as the tragic mom, Alison. I found this kaleidoscopic treatment of characters often frustrating. Everyone seems to have two or three nicknames, plus their real name — and sometimes I wasn’t even sure who was narrating a segment. But, that was also real to me — very much like real life where people turn up at odd moments of your life. I found that Welsh’s style worked in that respect, that all these characters were able to describe their view of this dysfunctional society they inhabited. The chaos of the book reflected well the chaos of their experiences — drugs, welfare, unemployment, crime, violence and pointlessness. This was a difficult read for me, but books shouldn’t just be pretty presents delivered up in a neat packages to open up and put on a shelf. 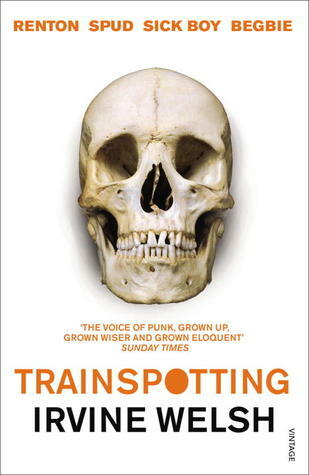 Trainspotting was raw, sometimes incomprehensible, jagged and almost unfinished. Welsh himself admitted that the heist scene at the end was just a way for him to finish the book — otherwise he’d be still writing it! I found this insight and others from listening to Welsh’s own discussion during a 2007 BBC World Book Club broadcast. Another book I probably wouldn’t have read, without the Guardian 1,000 list. Not the most enjoyable, but one of the most thought-provoking.